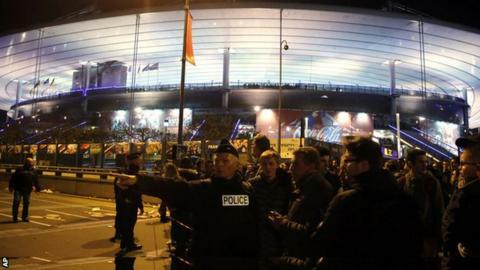 Two men tried to enter the Stade de France wearing suicide vests during the attacks on 13 November. Moving matches to different venues is another option being considered. "It's possible that matches would be postponed or played later," Kallen added. "But today there are no signs of any extreme threats or alarming issues." The international friendly between France and Germany at the Stade de France was one of several targets in the 13 November attacks, although suicide bombers were thwarted in their attempts to get into the stadium. Explosions were heard by people inside the ground but the match continued. The attacks left 130 people dead and many more seriously injured. The German national team remained in the stadium overnight. The Stade de France will host the opening game of the tournament between France and Romania on 10 June, as well as the final and other matches. Wednesday marks 100 days to the start of the finals.